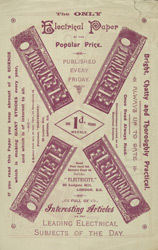 Reverse side of an advert for the Electricity and Electrical Engineering journal. Production of specialised journals such Electricity and Electrical Engineering multiplied rapidly during the 19th century. There was a general demand for new buildings such as railway stations and banks and so there was a corresponding demand for workers skilled in these areas. We cannot be sure of circulation figures but the very number of such specialised journals suggests that there was also a great demand for them.